Whether you call them snap beans, string beans or green beans, they are the second most popular home garden vegetable after tomatoes. It's easy to see why. The beans are relatively easy care and give off a good yield. Green bean seeds like warm soil and a full sun location. Don't plant any seeds until all danger of frost has passed and the soil temperature remains above 65 degrees. Some garden experts say you'll get the best results and overall healthier plants if you wait until the soil is at least 70°F. Some gardeners start bean seeds indoors. You can do this if you can provide the seeds the necessary warmth and light. Using peat pots you can start green bean seeds about 4-6 weeks before the last threat of frost for your area. Following the above rule for soil temperature the seedlings can be planted outdoors when they reach a height of 4 inches. Green beans also like well-drained and fertile soil. Buy compost-enriched soil or work plenty of aged organic matter (compost and well-rotted manure) into the soil. The soil pH should be between 6.0 and 6.8. Add lime if necessary. It's highly recommended, especially for first time gardens, that you test the soil. This is easy to do with a soil ph tester.You can purchase a Ph tester for between $8 and up to $100 or more. Here are two soil Ph testers, both under twenty dollars. Click images Below. Here is a great tutorial on how to test soil Ph from wikiHOW. Green beans prefer soil that has not recently been planted with beans, potatoes, tomatoes, lettuce or cabbage. Some garden experts suggest that you move your green bean plantings to a different spot each year. If you can't move them yearly, move them at least every three years. This helps prevent their roots from picking up any diseases from the dirt which could lead to root rot. Today it's easy to find fungicide treated seeds. The fungicide helps to prevent certain plant diseases from occurring. You can also choose beans varieties that are resistant to disease such as rust, powdery mildew, bean mosaic and curly top. This is not a guarantee you won't develop problems in the garden, but it's an extra measure of help against them. 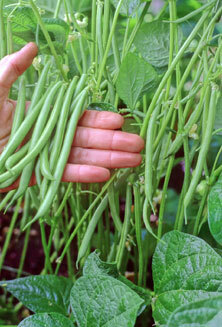 The size and configuration of your garden will be one of the determining factors of the type of beans you grow. There are two types, pole beans and bush beans. Place green bean seeds to a 1 inch depth. Cover the seed with dirt to fill the furrow . Plant the seeds 1-2 inches apart in rows that are 2 to 2 1/2 feet apart. Water well. When the bean plants reach 3 inches height, thin them to 3 to 4 inches apart. When planting pole beans you will want to plant them on hills or mounds. These mounds should be 3 feet apart with rows 3-4 feet wide. Place a stake in the center of the mound and place 3 or 4 bean seeds around the pole one inch deep in the soil. Water well and keep the seeds moist. You should see the seeds start to sprout within 7 days. You can fertilize the area about two weeks before you plant the green bean seeds with a 10-20-10 following manufacturer instructions, or you can add fertilizer directly to the furrows as you dig them. You'll need to continue to fertilize the beans during their growing season. Follow the manufacturers instructions. Scatter 1/2 cup of fertilizer over each 10 foot row of beans. Water the fertilizer well into the soil. One inch of water a week is the general rule, whether it comes via rain or the hose. Water the plants during spells of dry weather. Water them directly at their roots, trying to keep the plant as dry as possible. It's best to water in the morning so that the plant leaves can dry out. This helps prevent diseases like leaf mold. Do not let the soil dry out. Keep it uniformly moist at all times. This can help prevent blossom drop. Garden experts are at odds over exactly what causes blossoms to drop. Some believe it's due to fluctuations in moisture. Some think it's caused by fluctuations between day and night temperatures. Some think it's a combination of both. As an extra precaution, along with keeping the plants evenly watered and only watering at the roots, you can consider adding mulch to help keep soil temperature evenly regulated. Depending on the variety of seed you choose the growing season is between 45 and 75 days. Green beans should be harvested before you notice any bulge in the pod. The pods should be crisp and firm and should easily "snap" when broken in two (that's how green beans have also become known as snap beans). Handle the plant itself with care when harvesting the beans Don't tug or yank on the plant. Treat the plants gently and they'll continue to produce. Use one hand to hold the stem and one hand to pluck the bean. Harvest the beans when the plant is dry. The secret to a productive garden and a happy gardener is planning. Gardening success isn't guaranteed but you can help raise your odds. Make sure your garden soil is properly prepared. Make sure your garden will get plenty of full sunlight. You don't want every green bean in your garden to become ready to pick at the same time. No matter what type of vegetable you're planting in your home garden you want to stagger the plantings so you will have a continuous supply all season. In order to have a continuous supply of green beans throughout their growing season stagger the plantings. Plant seeds every three weeks until mid-season, but not past August. In order to help ensure your success if the soil is very dry in July-August plant the seeds at a depth of 1 1/2 inches to help them maintain adequate moisture. As green beans can suffer from fungus brought on by too much moisture (on the plant itself), make sure you practice wide row spacing to keep the moisture levels on the plants down. The secret to increase your green bean production is to keep picking them. The more you pick, the more will grow. The Mexican bean beetle is an enemy of your green bean garden as are aphids and leafhoppers. Holes in the leaves are an indicator of beetles or caterpillars. Manually remove any beetles you find and check the undersides of the leaves. If you see eggs remove the leaf. Spider mites and aphids can also be a problem in some gardens. You can consider treating with rotenone dust or a non-toxic insecticidal soap. It's always best to check with your local agriculture service agent for advice if you have any questions related to particular garden pests or pest control for your area.